My Ibanez RG470 is my old faithful, it’s the first guitar I ever bought myself, and my first decent guitar. I’ve had it since 1995, when I bought it brand new for around $800AUD. I’ve since upgraded it with an original Edge tremolo bridge and EMG pickups. It’s been through every gig and band I’ve played with, and the neck is like home. 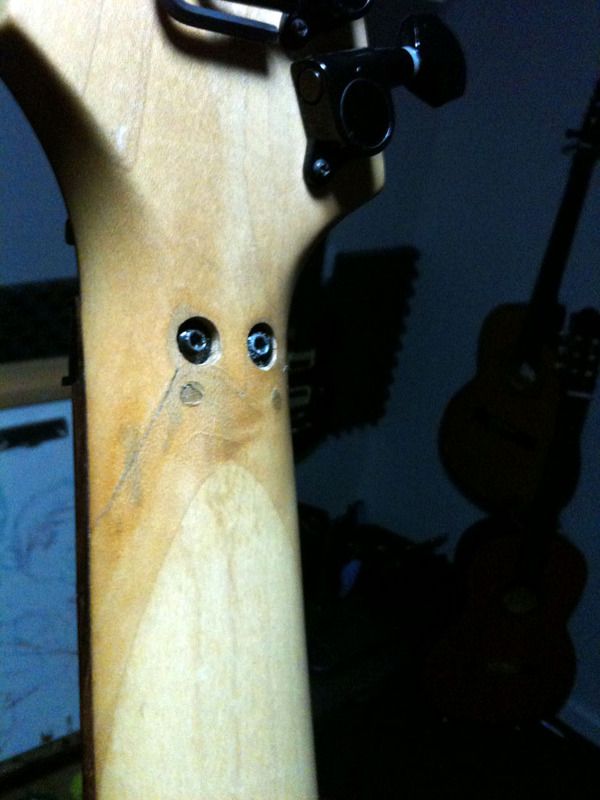 About 6 years ago it fell off my guitar stand, and the neck cracked behind the locking nut, a common place for cracking to occur with these era Ibanez guitars. It was all repaired, and has held up nicely since. On Wednesday I arrived at the studio to rehearse with my band. I was getting my guitar out of the car and the gig bag slipped out of my hand and fell on to the concrete driveway. I got inside and noticed that the old crack had reopened on one side. It also had a chunk of paint knocked off the back of the body. The guitar held tune for rehearsal at least, and after playing badly for the first few songs due to being depressed after the accident my old faithful still held up to a few hours jamming, never letting up. I’m hoping that I will be able to save this neck. I’d hate to have to replace it. I believe the neck is the soul of the guitar. This one may have very worn out frets that need replacing, but I want to keep playing it for many years to come. Hopefully I can repair it with my Father, drop in some new frets, and keep on rocking with it for many more years. Wish me luck! 2 Responses to "Cracked my neck (again)"
That’s awful. I know I would be gutted if my old faithful were injured like that. But they do say that a properly-repaired neck is usually stronger than it was before the break happened. Best of luck to you; I’m sure she’ll be playing again in no time, and the two of you will have many more years together! Yeah, I’m pretty cut up about it. Cracked in the same spot, so I’m guessing not quite enough glue was injected the first time. Hopefully we can get it right the second time.